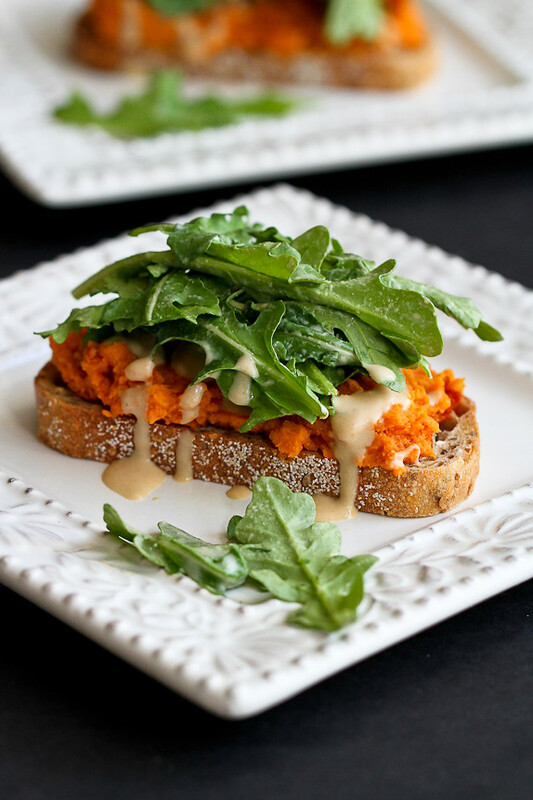 When you want something healthy and easy for lunch or dinner, this Sweet Potato Toast with Tahini Arugula is packed with fall flavors and plenty of health benefits. There are times when I can’t pinpoint exactly how or when I came up with a recipe idea, but I have no doubt about this one. It was a single quote that inspired the idea. A couple of weeks ago, I listened to an interview on NPR (National Public Radio, for those not in the U.S.), where Fresh Air’s Dave Davies was speaking to James Beard award winning chef, Michael Solomonov. Israeli-born Solomonov opened his first restaurant, Zahav, in Philadelphia in 2008 and just released a cookbook by the same name. When speaking about the heart of soul of Israeli cooking, Solomonov said, “On the first day, God created tehina.” Tehina, meaning tahini (ground sesame seeds) for those of us in North America. He uses it in sauces and dips, for glazing vegetables and for many other purposes beyond that. When I heard that, my mind exploded. Clearly, I was missing out on an ingredient that could add a layer of richness and flavor without much effort. The tahini inspiration quickly turned into an idea for a tahini salad dressing of some sort, with lemon juice for a hit of acid and a drizzle of agave nectar (or honey) to balance with sweetness. Perfect to dress some peppery arugula. When you have a flavor as lovely as tahini, why stop at a salad? Since it ’tis the season for all-things-sweet-potato, I quickly cooked up a sweet potato in the microwave (6 minutes or less!) and mashed it with ground coriander and paprika. I piled it all on top of a piece of toasted whole wheat country style bread, along with the dressed arugula. In about 15 minutes, you have a healthy, easy lunch or dinner that also happens to be vegan. Sweet potatoes boast a list of healthy benefits as long as your arm. Not only are they one of the best natural sources of beta carotene, but they are high in calcium, potassium, and Vitamins A and C. They are also fat free and relatively low in sodium. Some of my favorite side and main dishes involve sweet potatoes – grilled, roasted and stuffed. As for the tahini…well, I’m sold. I’ll be using it as far more than an ingredient for hummus from now on! 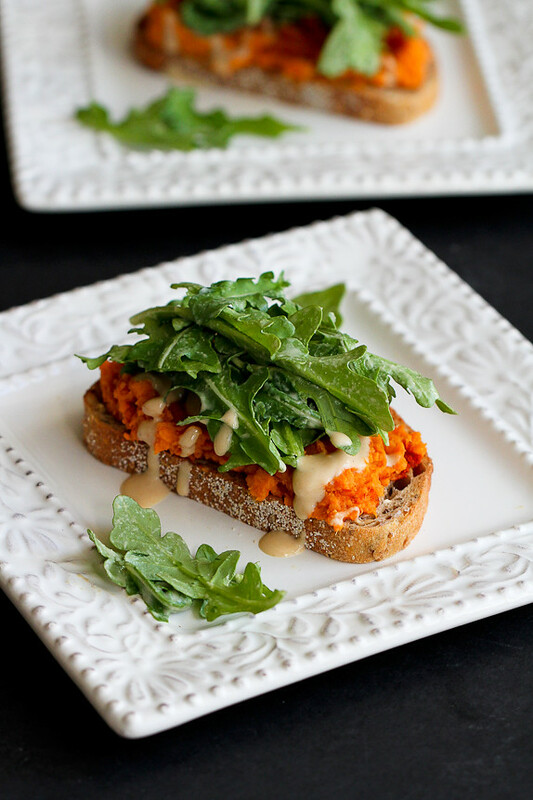 When you want some healthy and easy for lunch or dinner, this Sweet Potato Toast with Tahini Arugula is packed with fall flavors and plenty of health benefits. 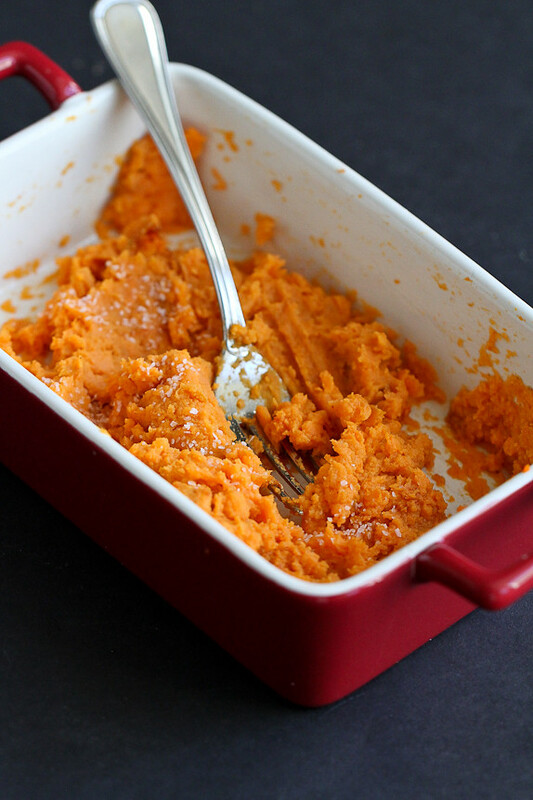 With a fork, pierce the sweet potato in several places. Place the sweet potato in the microwave, on top of a piece of paper towel, and cook for 3 minutes per side (about 6 minutes total), or until the sweet potato is tender when pierced with a fork. With the back of a fork, mash the potato flesh until most lumps are gone. Add the coriander, paprika and salt, and mix to combine. In a small bowl, whisk together the tahini, lemon juice and agave nectar. Toss with the arugula. Toast the bread, then divide the sweet potato mixture between the two pieces of toast. 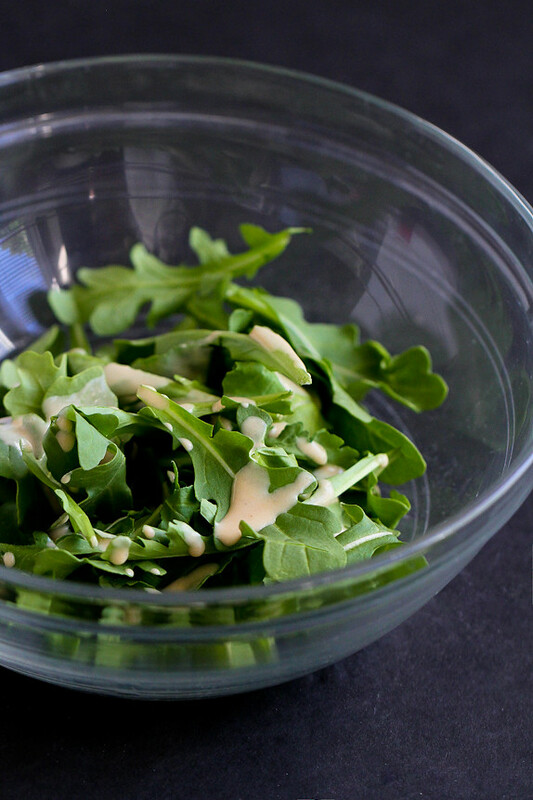 Top with the dressed arugula. Serve. This sounds like an explosion of flavor! I agree with with you Dara – tahini is a great extra ingredient to have on hand. Love this! Thank you, Ginny! Now I’m regretting not using tahini more often. It really does add a wonderful layer of flavor. I’ll be fixing that in the future, for certain! Thank you! I hope you have a chance to try it sometime. 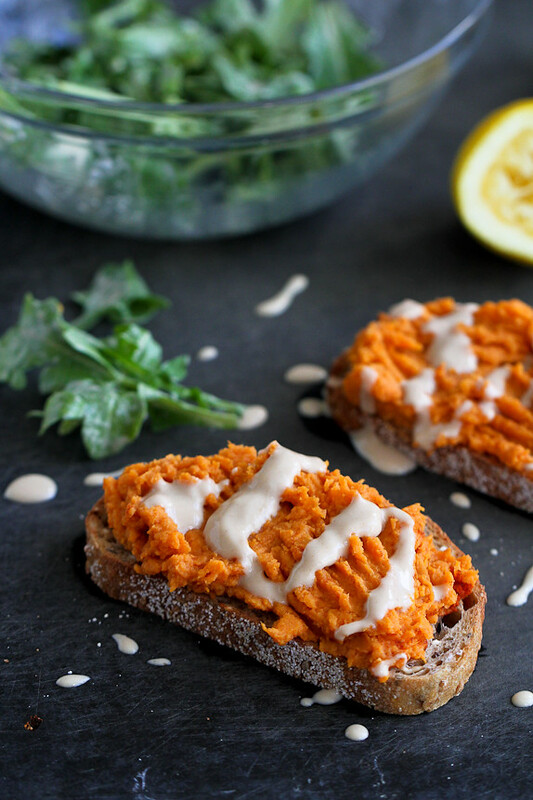 What a fun and unique flavor combination, I love sweet potatoes and I can see how this would make an amazing lunch! 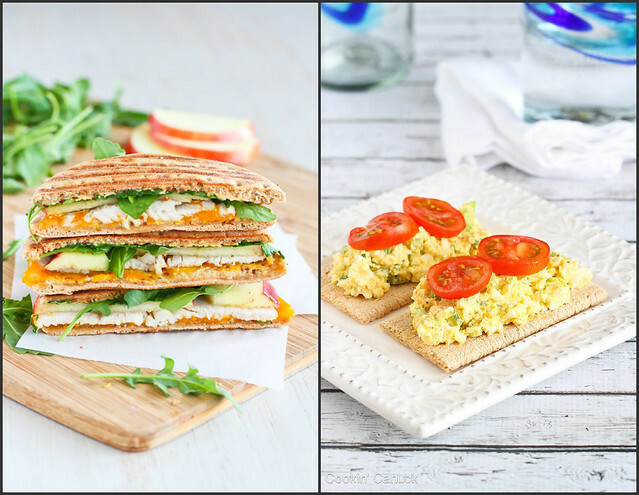 These look extra cravable – I have tahini in the fridge and a sweet potato in the pantry!! Tahini can be expensive when I only use it for hummus. I love the idea of mixing it in a dressing! I love hearing what inspires recipes. Sweet potatoes are such a healthy and delicious vegetable and I love how you totally elevated it. This is quick, easy and perfect for lunch. Now you’ve given me another way to use tahini which I don’t use very often. You have made snacking sooo creative and beautiful, Dara. Forget serving them to others, I would for sure be snacking on these toasts all day long! Pinned!